DALLAS--(BUSINESS WIRE)--Logile, Inc. today announced that retailers have again recognized Logile as a top retail technology provider in RIS News’ widely respected annual Software LeaderBoard. Logile’s LeaderBoard position continued to rise in the 2019 report, finishing ahead of all other vendors in the workforce management and human capital management space. For the second consecutive year, Logile is the only dedicated workforce management vendor to appear in the overall Top-20 list, RIS’s highest LeaderBoard honor, and is the highest-ranked workforce management vendor overall with an additional 36 Top-10 rankings including #1 in eight categories across customer satisfaction, innovation, service and support. This year, 294 retailers provided 585 vendor evaluations, administered by a third-party research firm for non-biased results. This eliminates marketing hype to reveal how software vendors stack up in head-to-head rankings. Dubbed the “Oscars of Retail Technology,” the resulting LeaderBoard report features 50 Top-10 lists centered around customer satisfaction plus the “coveted” Top-20 list of the top software vendors in retail. Logile’s stellar overall standing and growth with both tier one and mid-size retailers is indicative of its ability to deliver the right balance of innovative technology, performance and dedicated support. Highest forecast accuracy, automated, wall-to-wall metric scheduling, and staffing for all departments storewide are unique differentiators. 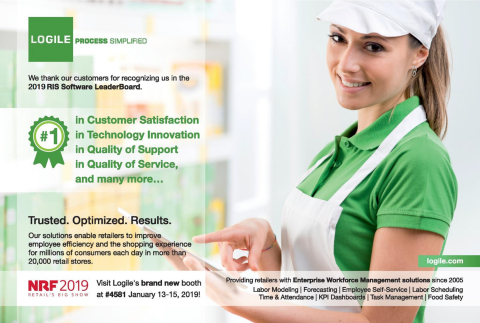 Logile’s All Mobile approach to workforce management (Logile Connect™ and Logile Labor Wizard™ app) and the first-ever virtual assistant for workforce management (Lychee™) also provide strong reasons why Logile garnered #1 Leader in Technology Innovation. To read the full 2019 RIS Software LeaderBoard report, click here. Logile will be at NRF 2019, Retail’s Big Show: Learn how we are shaping the future of workforce management and store operations for retailers worldwide with All Mobile. Visit us at Booth #4581, or schedule a meeting now. 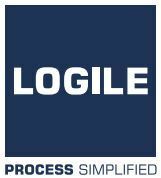 Logile, Inc. is the premier retail store operations solution provider, forging industry-leading technology innovation and best-practice expertise for workforce management and in-store planning and execution. We live WFM and store ops, but we exist for our customers’ success. Our proven machine-learning technology and retail industrial engineering help you accelerate ROI and achieve operational excellence with improved performance and empowered employees. Retailers worldwide rely on Logile’s intelligent, fully mobile solutions to boost profitability and competitive edge by delivering the best service at the optimal cost. From labor standards development and modeling, to forecasting, storewide scheduling, and time and attendance, to task management and employee self-service—we transform retail operations. Logile.com. Logile tops retail 2019 RIS Software LeaderBoard: #12 of Top-20 overall, 36 Top-10s, 8 #1s in customer satisfaction, innovation, service and support.